I am a cancer free, survivor patient treated with IPT/IPTLD. Testimonials: CHECK THE LIST! THE OFFICIAL LIST OF CERTIFIED I.P.T. PHYSICIANS BY DONATO PEREZ GARCIA, M.D. CHECK THE LIST! THE OFFICIAL LIST OF CERTIFIED I.P.T. PHYSICIANS BY DONATO PEREZ GARCIA, M.D. Today’s topic on the “I.P.T. Certified-M.D. Awareness Week” is “THE LIST”. This is where you can look up the names of all certified I.P.T. Physicians, trained and endorsed by Donato Perez Garcia. In it, you’ll find their full name, country of origin where they practice medicine, their Web site and/or email address as contact information. NOTE: Doctors that aren’t on this list are not certified I.P.T. Physicians, or have not renewed their license/certification status, please be aware of this important security fact. This list was created to ensure the safety of patients and people searching for I.P.T. as their treatment option. Your safety, or your loved one begins with this choice. Take time to review it, know if the person you’re entrusting your health and life is fully competent and updated on Insulin Potentiation Therapy. Remember, I.P.T. is a safe procedure, WHEN administered by a trained physician. 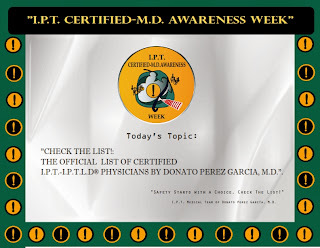 Where can I find “THE LIST” of Certified and Endorsed I.P.T. Physicians?